Yes we took a vacation 2 weeks ago on the motorcycle. But Donna said she hadn’t been on a 100 mile or more day-ride in a long time. The dogwood trees are in full bloom here so we decided to ride. No, the two are not related in any way other than the dogwood trees are in bloom and we rode. I was also trying out my new Tourmaster Tracker Air Pants (you can read the review on this link; wink, wink, nudge, nudge). Donna had a store meeting this morning but was off the rest of the day. I dropped her off in the car and headed back home. Then when her meeting was over I headed back. There she was on the curb so I pulled up and asked “Hey lady do you want to go for a motorcycle ride?” She said she wanted the Italian hoagie sandwich for lunch at Turner’s Corner near Cleveland, GA and I wasn’t going to argue, nor did I want to. We went and met Sean & Christine (and their Victory Cross Country Tour) and we were off. It’s a destination and route we’ve taken numerous time before but it’s always fun. We headed up towards Jasper, GA and then on to Marble Hill. Before we reached Dawsonville we headed north on Steve Tate Highway (it’s really just a two lane road) until it dead ended at Georgia HWY 136 to HWY 183. It was then literally just down the hill to HWY 52 which would take us to Dahlonega. While on HWY 52 we came up behind a motor home towing a car. They had South Dakota plates so they weren’t local. Now normally we hate being behind a motor home on mountain roads but this guy could drive. He was moving along well enough that we had no desire to pass him. He seemed to not like when an SUV got in front of him on HWY 9. We headed for Turner’s Corner. Along the way approaching motorcyclists were patting their helmet warning of the police ahead. It wasn’t long before we found the Sheriff’s car on the side of the road. There was a motorcycle in front of us and the female passenger waved at him as they passed. He stuck his arm out the window and waved back. We know he was out there looking for scofflaws on the curvy road but he was also waving at passing motorcycles too. After lunch we rode up US129 on Blood Mountain and it’s combination of sweeping and sharp curves. After Blood Mountain it was a short trip over to The Richard B Russell Scenic Highway (GA HWY 348) and its nice curves going up and down the mountain. On the way back down, heading south we noticed we were on fresh asphalt. Sometimes motorcyclists are so easy to please! The new asphalt was nice and smooth. The tires gripped the curves like glue and we took those curves at a higher speed and even left some scrape marks in the new pavement. Once we reached the bottom at HWY 75 Alt. Sean took the lead and took us on Adair Mill RD eventually bringing us out on US 19 where we headed up to Rider’s Hill for ice cream. While sitting in the rocking chairs not one but two of the new BMW R Nine-T motorcycles pulled up. The tall, bald-headed guy looked familiar but at the moment I couldn’t place him. I went inside and noticed the owner of BMW Motorcycles of Atlanta in the shop. He was with the bald-headed guy who I now recognized to be BMW factory rider Nate Kern. The owner, Bob recognized me and we chatted for a moment. They headed out and Nate got on one the new R Nine-Ts and Bob the owner got on his R 100 Dakar. From there it was time to head for home. The only bad part of the day was the yellow pollen that coats everything, including us, this time of year. The Magic Carpet amongst the dogwoods at Rider’s Hill in Dahlonega, GA. I was supposed to go to a Blue Knights meeting today but I played hooky. It was too good a day to ride just a few exits on the interstate to go to lunch meeting and then go home. Since I’m not a Chapter Officer anymore it was easy to do. Donna said she wanted to go for a “long ride” today. It was our first fall ride of 2013. The leaves are already changing and dropping (or is that FALLing) here in north Georgia and it’s only the last weekend in September! Maybe all the rain we had this summer has something to do with it. We had no plan, just a direction and a couple of lunch ideas in our heads. It was a beautiful, cloudless blue sky and the forecast was for a high temperature of 77F. Actually for most of the day’s ride it was in the upper 60’s for temperatures and was great. We were on Georgia HWY 53 headed for Dawsonville when Donna asked “What about that road past Big Canoe?” I told her it would take us straight out to GA HWY 136 and we could take that on up to GA HWY 52 and then take HWY 9 right on into Dahlonega. “Yeah. Do that.” came through the headset. So we took Steve Tate HWY passed Big Canoe and then with its tree covered hills and curves. When we made it over to HWY 52 we were passing some pumpkin fields. It was really feeling like fall now. We passed a “pumpkin patch and corn maze” where traffic slowed just a bit. It was odd that we didn’t see any other motorcycles along our route until we got to HWY 9 and headed for Dahlonega. Donna wanted to stop in at Rider’s Hill for a short break after I told her that our lunch stop would Turner’s Corner Café, to which I got an excited “Yippee!” through the intercom. We left Rider’s Hill behind us taking GA HWY 9/60 to the Rock Pile was it was US 19 though the hills and curves until Turner’s Corner Café where we had lunch out on the deck overlooking the intersection and the river. A couple of sport bikes made the left and headed up US 129 and up Blood Mountain. When one revved his engine out of site, Donna said “Let’s go that way! How long will it take to get home?” Even though home was to the south and that route would take us north, a little math from a sign for Blairsville told me we could there in 30 minutes. So I told Donna that Blairsville was about 30 minutes away and I knew home was an hour and a half from Blairsville so I’d get us home about 5:00 pm. “Let’s go.” Going up Blood Mountain wasn’t a special ride for us, we’ve ridden it numerous times. But it’s a nice fun, curvy road with a good surface and good visibility. We were passed by bikes going the other direction in the curves that looked like they were on a race track! Not just the leaning but the speed! Local resident’s have been “venting” in a the Atlanta paper’s column “The Vent” about the speeds of motorcycles this summer. They know motorcycles have always been on the road but they’re now complaining about the speeds and I see why. It’s only a matter time before the Georgia State Patrol begins a dedicated enforcement action. I don’t care how a good a rider you think you are, it’s a public roadway and not a personal raceway. It was a good day and fall is in the air! We stopped in at Rider’s Hill before heading for lunch. We weren’t the only motorcycle at Turner’s Corner Café. There were actually quite a few. Donna dining on the deck at Turner’s Corner Café. I met one our blog readers and a fellow reader of the bmwlt.com message forum today. 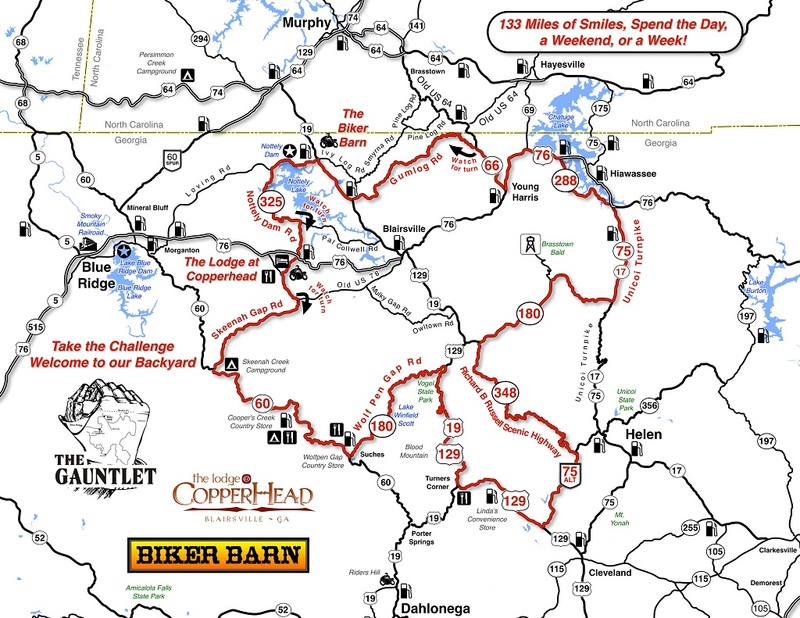 Scott and his wife are vacationing on their BMW K1200LT from Michigan and are staying up in Hiawassee for a few days. Scott had gotten in touch a while back so that we could get together and ride while they were here. Today was that day. Unfortunately Donna had been put on the work schedule and couldn’t get anyone to swap with her so it was just me today. I had a great cool ride from the homestead up to Hiawassee. Around Blue Ridge it got pretty foggy and the mountains were shrouded in the fog. 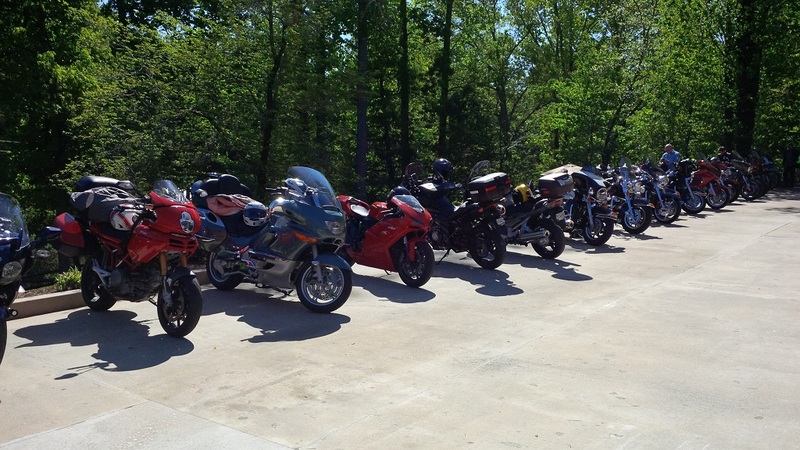 We planned on meeting at the Blue Otter Restaurant in Hiawassee before heading out for a ride that included lunch. As it turned out, the three of us had all skipped breakfast and were hungry so we just decided to start with lunch right there at the Blue Otter. We then headed through Hiawassee before heading south down Georgia Highway 17 towards Helen. We made the turn on Highway 75 Alt and I wanted to point out Goats On The Roof along the way in Scorpion Hollow (unincorporated) but as we approached, there were no goats and the property was vacant with a large “For Sale” sign out front. We then turned back north on US Highway 129 to head up Blood Mountain and head for Blairsville. We stopped for a break at the Appalachian Trail crossing and I asked “Was that stretch of road okay?” It must’ve been a good choice because both Scott and his wife were grinning from ear to ear while taking off their helmets and nodding their heads. But soon it was time to head back down the mountain and for Blairsville where we’d say our goodbyes. It was fun to ride with another K1200LT also. You usually don’t see many of them out on the road, let alone two of them together. Scott it was a pleasure and fun riding with you guys today and we wish you a safe journey on the rest of your trip and on your way back home. 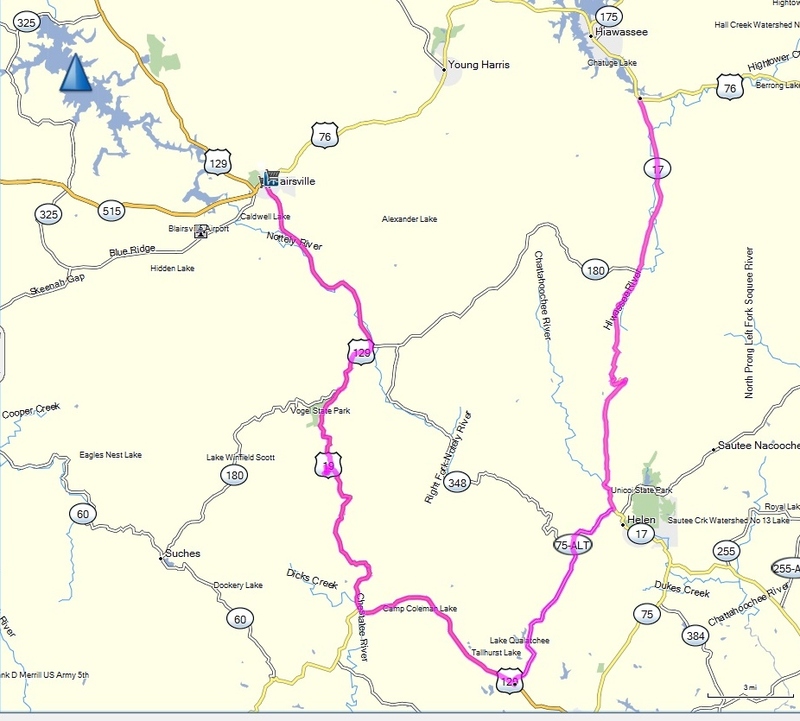 The route taken by our two BMW K1200LT motorcycles today. Yesterday was Mother’s Day here in the US. Donna and her sister took their Mom to lunch and then Donna had to work later that afternoon. I called my Mom who lives in another state. But what did I do on Mother’s Day? Why I went for a motorcycle ride! Now some may think this unusual but Donna has even requested to that before on Mother’s Day and birthdays. I guess I’m one lucky guy. My Blue Knights Chapter had to cancel a ride the day before because of a forecast of a high probability of thunderstorms. Those thunderstorms never materialized. But there’s an old aviation saying about cancelling a flight that can be compared to motorcycling, “It’s better to be down here wishing you were up there than to be up there wishing you were down here.” So on Sunday a friend, Sean, and I went for a ride. We were going to pre-ride a route for an upcoming Blue Knights ride. We met in Jasper, GA under a nearly cloudless blue sky with temperatures already warming into the mid 60’s. We took off and headed for Talking Rock before heading up over Burnt Mountain on GA HWY 136. I don’t know what it is about Burnt Mountain but it’s always significantly cooler up there. Along the top, the temperature dropped down to 51 and when Donna and I were up there about 2 months ago there was snow on the side of the road when the mountain tops in the area hadn’t seen snow for over a week! We headed on through Dahlonega passing Rider’s Hill and making the turn at the Rock Mound for Turner’s Corner and US HWY 129. Turner’s Corner wouldn’t be our lunch stop today as we were going to have BBQ in Blairsville. But now it’s time to vent. Some people shouldn’t ride motorcycles. Or if they do, they should pull over and let the line of cars and motorcycles pass them. On US 19/GA 9, between GA 60 and US 129 we got stuck behind a couple on a Kawasaki Vulcan cruiser, a “Harley-A-Like” bagger. He had highway pegs mounted high up on his crash bars. He had the pegs angled so his feet pointed to the sides of the road. This guy literally looked like he could’ve been at the gynecologist’s office for an exam! That was just to paint a picture. He would go along at 45 mph or higher; until he reached a curve. When he reached a curve his brake light would come on and he would slow dramatically. Come out of the curve and he’s speed up until the next curve and repeat it again. The entire stretch of road is probably a no passing zone and there was car between us, so I didn’t pass them. Then I noticed (because I had nothing better to do while creeping along) that when he would brake in the curves that his feet were still up on those highway pegs! He was braking hard using only his front brake in curves. When we got to US 129 to go up and over Blood Mountain, this guy on his Kawasaki sadly turned left. Great, now we were going to be behind him on a really curvy road! He started his routine all over again. But luckily, it wasn’t long before we got two lanes on our side of the road with a nice sign that reads “Keep Right Except To Pass”. So I drop to 4th gear, pull out into the left lane give the gas; good. I wanted to pass this guy as quickly as we could! Then to my amazement as I’m parallel to him, he begins changing lanes into me in a curve to the left. I saw the shock and panic on his face. I’m sure that if I had hit my horn he would’ve wrecked. But we put him in our rear view mirrors. It wasn’t until we stopped for lunch that Sean told me how close that Kawasaki had gotten to me. Since Sean and I were both riding solo, we rode a bit more “spirited” than if our wives were with us. The BMW K1200LT is an 850 pound touring motorcycle can that do a pretty good impersonation of a sport bike at times. We got to a nice sweeping, angled and sharp right curve and I was really leaning into to it, “motor officer style”. That means pushing the bike over while your body is upright. Suddenly I felt my right foot peg scraping the road! I guess I was leaning a bit far! Usually when riding 2 up and we’re leaning like that, the side stand on the left or the center stand on the right will scrape first as a warning. I didn’t get that warning being solo and it surprised me a bit. I got to thinking later and realized that those foot pegs are pretty high off the ground to begin with. In the same spot Sean drug the right floorboard of his Victory Cross County Tour through the whole curve. We had a really good time going up and over the mountain. If you’ve been in the area you know what a well maintained, curvy and fun road US 129 over Blood Mountain can be. We stopped for lunch in Blairsville before getting back on the motorcycles and taking a more sedate and leisurely route home. As we were getting ready to leave the BBQ restaurant, a group of 5 Triumph motorcycles pulled in just in time to take our parking spots as the lot was full. I even made it back home in time to kiss Donna before she headed off for work. But I did cook her a dinner she wanted when she got home. Now Donna wants to go for a ride because it’s been a while. Where should we go……….. The Roadrunner (L) and Magic Carpet (R) at our lunch stop. The bronze colored area in the circle is where I scraped. The foot peg I scraped is in the circle. You can see how high they are. WOOHOO! 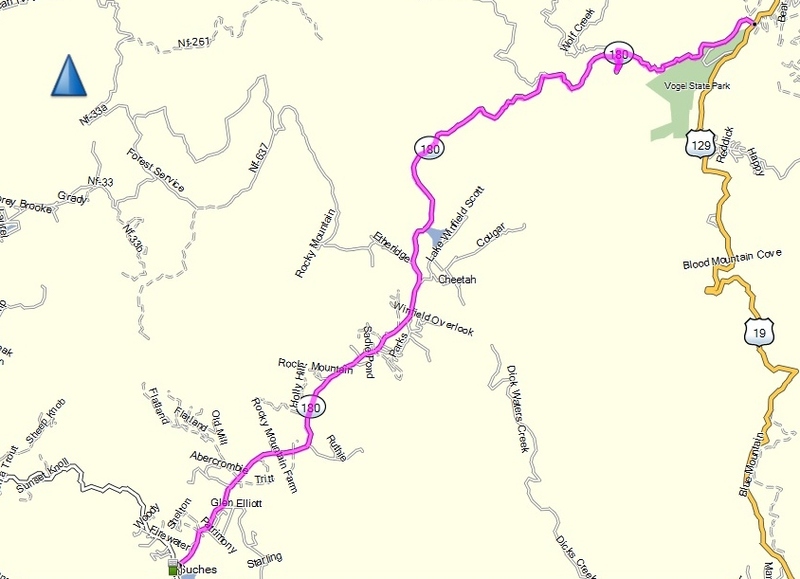 Our route on Mother’s Day. Yep, you read that right we have “Date Rides” and today was one of them. It had been a while since Donna was on the back of the Magic Carpet. In fact she may not have ridden yet this year. This past Wednesday we woke to a dusting of snow on deck and rooftop here in northern Georgia. Further north in the state they had snow on the ground again. Fast forward to today, Friday. The forecast was for temperatures just above 60 degrees and for a cloudless blue sky. Over morning coffee we decided it was time for a “Date Ride”. We headed north from the house going through Canton and Jasper while headed for a different than normal route, going through Talking Rock, Georgia this time. In Talking Rock we took GA HWY 136 over Burnt Mountain were there was still some snow along the side of the road at the higher elevations. There was also a good bit of the gravel that GDOT had so generously spread on the road, especially in the curves on the mountain. There was enough that you could see it in the center of the lanes so we didn’t take the curves as “spirited” as we would’ve like to blow out some cobwebs. The plan was to head up through Dahlonega then up over Blood Mountain and have lunch in Blairsville before heading for home. Now here’s the advantage to a “Date Ride” with just the two of us. We changed our plans along the way while riding. We decided on lunch at Turner’s Corner Café in Cleveland and then heading for home. During the ride, Donna said she was formulating an article in her head about the floorboards that she likes. I like the ear plugs so much that I recently got some E.A.R. Do It Yourself Custom Molded Ear Plugs. The jury is still out on the custom plugs. I had to raise the volume on the intercom to hear it and the GPS (and they were muffled) so they’re definitely quieter. But there seemed to be more wind noise. The other Etymotic plugs I had gotten are designed to block sound but let conversation be heard. I’ll have to try them both on a ride one day to compare them better. It was a really great day for a “Date Ride”.